The Jerusalem Post is a broadsheet newspaper based in Jerusalem, founded in 1932 during the British Mandate of Palestine by Gershon Agron as The Palestine Post. In 1950, it changed its name to The Jerusalem Post. In 2004, the paper was bought by Mirkaei Tikshoret, a diversified Israeli media firm controlled by investor Eli Azur. In April 2014, Azur acquired the newspaper Maariv. The newspaper is published in English and French editions. Formerly regarded as left-wing, the paper underwent a noticeable shift to the right in the late 1980s. From 2004, under then editor-in-chief David Horovitz, the paper took a more centrist position, competing against the staunchly left-liberal Haaretz. Its former editor Steve Linde aimed to provide balanced coverage of the news along with views from across the political spectrum. In April 2016, Linde stepped down as editor-in-chief and was replaced by Yaakov Katz, a former military reporter for the paper who previously served as an adviser to Education and Diaspora Affairs Minister Naftali Bennett. An antecedent paper, The Palestine Bulletin was founded in January 1925 by Jacob Landau of the Jewish Telegraphic Agency. It was owned by the Palestine Telegraphic Agency, which was in practice part of the JTA even though it was legally separate. On 1 November 1931, editorship of the Bulletin was taken over by American journalist Gershon Agronsky (later Agron). In March 1932, a dispute arose between Landau and Agronsky, which Agronsky resolved to settle by establishing an independent newspaper. However, Landau and Agronsky instead came to an agreement to transform the Bulletin into a new jointly owned newspaper. Accordingly, the Palestine Bulletin published its last issue on 30 November 1932 and The Palestine Post Incorporating The Palestine Bulletin appeared the following day, 1 December 1932. On 25 April 1933, the masthead was reduced to just The Palestine Post, though the newspaper continued to state its founding year as 1925 for at least a year afterwards. During its time as The Palestine Post, the publication supported the struggle for a Jewish homeland in Palestine and openly opposed British policy restricting Jewish immigration during the Mandate period. According to one commentator, "Zionist institutions considered the newspaper one of the most effective means of exerting influence on the British authorities." On the evening of 1 February 1948, a stolen British police car loaded with half a ton of TNT pulled up in front of the Jerusalem office of the Palestine Post; the driver of a second car arrived a few minutes later, lit the fuse and drove off. The building also contained other newspaper offices, the British press censor, the Jewish settlement police, and a Haganah post with a cache of weapons. Arab leader Abd al-Qadir al-Husayni claimed responsibility for the bombing, but historian Uri Milstein reported that the bomb had been prepared by the Nazi-trained Fawzi el-Kutub, known as "the engineer", with the involvement of two British army deserters, Cpl. Peter Mersden and Capt. Eddie Brown. Three persons died in the bombing, a newspaper typesetter and two people who lived in a nearby block of flats. Dozens of others were injured and the printing press was destroyed. The morning paper came out in a reduced format of two pages, printed up at a small print shop nearby. In 1950, two years after the State of Israel was declared, the paper was renamed The Jerusalem Post. The broadsheet newspaper is published from Sunday to Friday, with no edition appearing on Saturday (the Jewish Sabbath) and Jewish religious holidays. Regular opinion columnists write on subjects such as religion, foreign affairs and economics. As of 2016[update] the managing editor is David Brinn. Some of the material is translated and included in the free Hebrew daily Israel Post, of which Eli Azur is a co-owner. In January, 2008, the paper announced a new partnership with The Wall Street Journal, including joint marketing and exclusive publication in Israel of The Wall Street Journal Europe. The Jerusalem Post also publishes a monthly magazine titled IVRIT edited by Dr. Sarit Yalov. Its target audience is people learning Hebrew language and it is described as "an easy-Hebrew" publication, meant for improving basic Hebrew reading skills. It uses the vowel notation system to make comprehension of the Hebrew alphabet abjad simpler. The Jerusalem Report, now edited by Steve Linde, is a fortnightly print and online glossy newsmagazine. Until 1989, the paper supported the forerunners of the Labor Party. In 1989, the paper was purchased by Hollinger Inc., owned by Conrad Black. A number of journalists resigned from the Post after Black's takeover and founded The Jerusalem Report, a weekly magazine eventually sold to the Post. The leader of the walkout was David Landau, who founded the Haaretz English Edition and went on to become editor-in-chief of Haaretz until 2009. Under editor-in-chief David Makovsky, from 1999 to 2000, the paper took a centrist position. In 2002, Hollinger hired the politically conservative Bret Stephens of The Wall Street Journal as editor-in-chief. David Horovitz, who holds a center-left worldview, took over as editor-in-chief on 1 October 2004. He was expected to have the paper eschew any clear political line, and the paper turned centrist again. On 16 November 2004, Hollinger sold the paper to Mirkaei Tikshoret Limited, a Tel Aviv-based publisher of Israeli newspapers. CanWest Global Communications, Canada's biggest media concern, had announced an agreement to take a 50 percent stake in The Jerusalem Post after Mirkaei bought the property, but the deal soured. The two sides went to arbitration, and CanWest lost. In 2011, Horovitz was succeeded by the paper's managing editor, Steve Linde, who sought to maintain its political moderation and balance. Yaakov Katz succeeded Linde in April 2016. JPost.com was launched in December 1996. 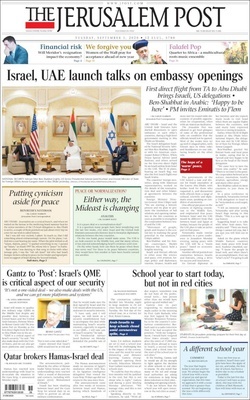 Its current version also contains a French language edition (fr.jpost.com), blogs, an ePaper version of the daily newspaper, a range of magazines and other web versions of the Group's products. According to Alexa Internet traffic rankings, JPost.com is among the top 3,000 websites in the United States. The site is an entity separate from the daily newspaper. While sharing reporters, it is managed by different teams. Its staff is based in Tel Aviv, while the newspaper offices are located in Jerusalem. The site contains archives that go back to 1989, and the default search on the site sends users to archive listings, powered by ProQuest, where articles can be purchased. Free blurbs of the article are available as well, and full articles are available when linked to directly from navigation within JPost.com or from a search engine. JPost.com includes the "Premium Zone", a pay-wall protected area, containing additional Jerusalem Post articles and special features. The site, which was given a graphic facelift in September 2014, recently relaunched its mobile and tablet applications, as well as its special edition for mobile viewing. ^ a b c "Jerusalem Post". Encyclopedia Judaica. 2007. ^ "The Jerusalem Post (Israeli newspaper)". Encyclopædia Britannica. Retrieved 2013-11-21. ^ "The Israeli Press". Jewishvirtuallibrary.org. Retrieved 2013-06-08. ^ a b "Yaakov Katz named new 'Post' editor-in-chief". The Jerusalem Post. Retrieved 17 May 2016. ^ a b c d e Michael D. Birnhack (2012). Colonial Copyright: Intellectual Property in Mandate Palestine. Oxford University Press. ^ Palestine Bulletin, 31 October 1931. ^ Palestine Post, 25 April 1993 and 25 August 1934. ^ Uri Milstein, History of Israel's War of Independence, Vol III (English edition: University Press of America, 1997, ISBN 0-7618-0769-1), pages 105–107. ^ Mel Bezalel (May 7, 2009). "'The truth is louder than TNT'". The Jerusalem Post. Retrieved 2013-11-21. ^ The Palestine Post, 5 February 1948, p3. ^ "The Jerusalem Post - About Us". www.jpost.com. ^ "JPost | French-language news from Israel, the Middle East & the Jewish World". Fr.jpost.com. Archived from the original on 22 December 2011. Retrieved 21 November 2013. ^ "Ivrit". Jpost.com. Retrieved 2013-06-08. ^ "CanWest loses battle for 50% of 'Jerusalem Post'". The Jerusalem Post. Archived from the original on 25 October 2012. Retrieved 8 June 2013 – via Highbeam.com. ^ "Horovitz steps down, Linde taking over as JPost editor". The Jerusalem Post. 2011-06-12. ^ "Interview with Steve Linde, chief editor of the Jerusalem Post". European Jewish Press. 29 November 2011. ^ "Jpost.com Site Info". Alexa.com. Retrieved 2013-11-21. ^ "Yafo 206, Jerusalem, Israel to HaAhim MiSlavuta 13, Tel Aviv-Yafo, Israel - Google Maps". Maps.google.com. 1970-01-01. Retrieved 2013-11-21. ^ "Pqarchiver.com". Pqasb.pqarchiver.com. 2008-03-02. Retrieved 2013-06-08. ^ "Horovitz steps down, Linde taking over as JPost editor". Jpost.com. Retrieved 2013-06-08. This page was last edited on 17 January 2019, at 18:26 (UTC).